Jeffrey Harryman turned a starting bankroll of $200 into $2,214.50 to win the Laurel Champions Tournament at Laurel Park on Saturday, August 18. Harryman won a $10,000 Breeders’ Cup Betting Challenge entry, a cash bonus of $2,790, plus his final bankroll total was his to keep. His total return: cash and prizes worth $15,004.50. The date has been set for the 2018 renewal of The BIG One. It’s September 22-23, and once again, it will be hosted at Laurel Park. Ed Peters started the second and final day of The BIG One with just $200 left from his starting bankroll of $1,000. And it went downhill from there. A daring, all-in bet very early in the day propelled Eric Moomey to a lead he maintained throughout the day here on Day 1 of The BIG One at Laurel Park. In Laurel, Md. As we kick summer into full gear, so must we kick qualifying for The BIG One into full gear. Starting this Sunday, June 18, each HorseTourneys qualifier will offer two guaranteed, all-inclusive packages to The BIG One, rather than one. The BIG One just got bigger. HorseTourneys announced today that it will pay a $500,000 bonus to the winner of the 2017 The BIG One should that player go on to finish first in the 2018 National Horseplayers Championship (NHC) Presented by RTN, Stats Race Lens and Treasure Island. And we’re not talking about an annuity. The bonus would be paid in a lump sum of $500,000. 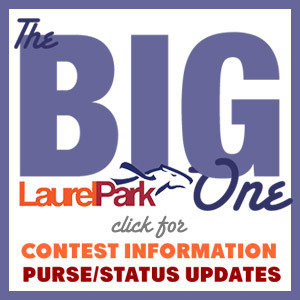 The first direct qualifier for the 2017 The BIG One, set for Sept. 23-24 at Laurel Park, is this Sunday. If The BIG One isn’t near the very top of your 2017 priority list in terms of on-site tournaments to shoot for, it really should be. The Big One, to be held at Laurel on Sept. 24-25, isn’t the only tournament around offering BCBC spots, NHC seats, HPWS seats and cash. But you certainly won’t find another tournament that offers all of the above while limiting the field to no more than 57 entries. That’s why we call it “The High-Expectation Tournament”; when players walk into the Carriage Room at Laurel, they know they have an excellent chance to walk away with something meaningful. And we’re not talking about a couple of seats to the BCBC and NHC. Last year, The Big One awarded the top 5 finishers entries to BOTH the BCBC and NHC, plus another five got NHC seats (finishers 6-10), and the next 10 (11-20) won HPWS entries. And more than $197,000 in cash went to the top 10 in the standings. This year we hope to stick to roughly the same prize schedule, except that the goal is to give away eight BCBC seats instead of five — all while still holding participation to no more than 57 entries. If you are into tournaments for which the pay line is very deep, The Big One is where you want to be on the last weekend in September. Of course, a The Big One package, available only at HorseTourneys or at select Laurel Park qualifiers, is much more than a $1,000 bankroll, a pat on the back and a wish of good luck. It includes a three-night hotel stay in addition to $500 in travel expenses. A welcome dinner and cocktail reception on the night of September 23 are also included, as is open bar and buffet on both days of the tournament. If you go home from The Big One without a BCBC, NHC or HPWS seat, you can chalk it up to bad luck, we suppose. But if you go home without being well fed, it’s all your fault! NEW FOR 2016: In prior years, The Big One was a mythical-money tournament, but this year, based on player feedback, it will be a live-bankroll competition with a total starting bankroll of $1,000. Ten plays of at least $50 each must be made each day, with win, place and exacta wagering available. Each day, five plays must be made on designated mandatory races, with five others being optional, “player’s choice” plays. SAME (ODDLY) AS IN 2015: As was the case in the dog days of last summer, participation levels in The Big One qualifiers have dipped in recent weeks compared to earlier- and later-in-the-year levels. These declines — if they continue — could ultimately have an adverse affect on final prize levels, but they also represent an absolutely terrific opportunity to qualify at HorseTourneys.com, where competitions typically carry two guaranteed packages regardless of the number of entries. There were 29 contestants each of the last two weeks, so contestants had approximately an 8% chance of qualifying for a tourney that would award major tourney seats to more than one-third of all participants. Sure beats buying lottery tickets! The bad news is that there are only 18 spots left for which players may qualify online. So time’s a wastin’. The next direct qualifier is Sunday, July 24. We’ll also have a “Round 2” direct feeder the day before…plus low-cost feeders to both all week long. These pages are filled with Big One information and are updated each and every week so players know exactly where they stand, and the tournament stands, as the year progresses. 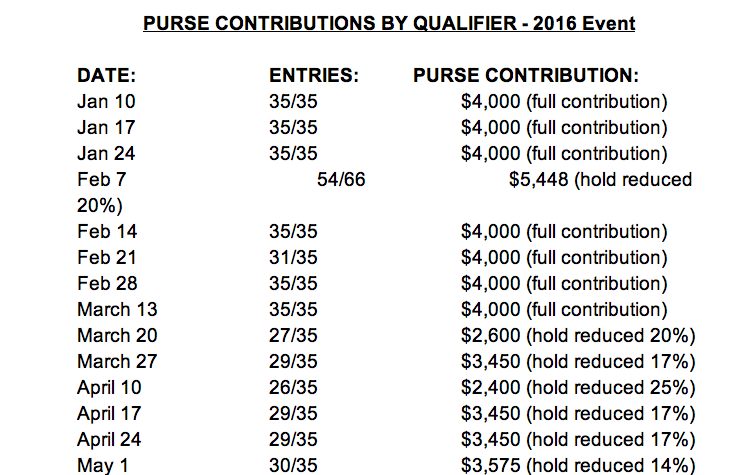 Our current projected cash purse sits at $128,000, pending subsequent qualifier participation levels. Transparency is very important to all of us here at HorseTourneys in everything we do. If you have any questions about The Big One — or anything else — send us an email at support@horsetourneys.com and we’ll do our best to answer it as quickly as possible.